The Thermophore Automatic Moist Heat Pack delivers targeted, adjustable, moist heat to your problem areas. This innovative technology differs significantly from heating pads and hot towel treatments. Why is moist heat more effective than dry heat in relieving pain? It has been proven that water is a more effective conductor of heat than air. In addition, body tissues are able to tolerate moist heat at a higher temperature than dry heat. As this intense heat penetrates painful body tissues, blood vessels dilate, increasing the circulation in the area. The increased blood flow relieves inflammation, brings additional oxygen, carries away toxins and waste for healing, and provides relief from pain. 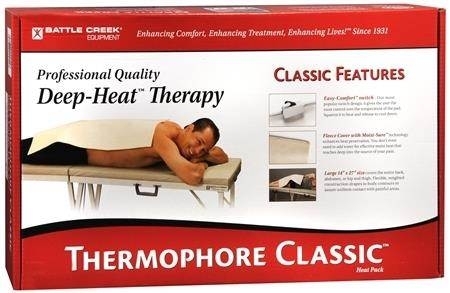 The Thermophore pack makes a hot fomentation compress without adding water, using drippy towels or soaking in a tub, to provide temporary relief from pain. It eases the cycle of pain and muscle spasm to allow for more natural movement and comfortable rest. It is especially effective in providing relief from the pain of arthritis, back or neck pain, muscle strains or respiratory congestion. Each Thermophore unit has a specially woven fleece blend cover. During storage, this cover traps moisture from the atmosphere in the air spaces between the textile strands. When the special safety switch is activated, the Thermophore pack becomes intensely hot very quickly. Through a hygroscopic action, the moisture moves away from the source heat to the cooler body tissue. When properly applied, a layer of moisture is produced between the Thermophore pack and the body to effectively transfer heat directly to the painful area. Is it necessary to add moisture to the Thermophore Pack? No, you add nothing. Simply place the Thermophore pack on the affected body area, depress the switch, and within moments, intense moist heat will penetrate tissues to relieve pain. In some regions of extremely low humidity, it may be necessary to store the Thermophore in a humidified room. In particularly dry situations, a stupe cover has been developed to provide moisture directly to the fleece blend cover. Why is the Thermophore Pack so much heavier than ordinary heating pads? To relieve aches and pains with hot fomentation treatments, it is necessary for the heat to effectively transfer deeply into body tissues. To make the Thermophore pack more efficient, we have positioned weights to cause the Thermophore pack to conform to body contours. This reduces air spaces between the Thermophore hot pack and body; so more heat is transmitted to the body tissues. Ordinary stiff plastic heating pads leave air pockets. Which result in uneven transfer of heat. Why does the Thermophore Pack have a special, spring-loaded switch? The Thermophore pack treatment is so soothing and relaxing that users often doze off as their pain and tension eases. If the user does fall asleep, their hand will relax, automatically turning the unit off. No other product has a safety switch quite like the Thermophore Pack. The Thermophore pack also has heavy-duty “strain relief” areas molded on each side of the switch for added durability. Why not just buy an ordinary heating pad instead of paying so much more for a Thermophore unit? An ordinary heating pad is not hot enough to provide the same level of comfort and temporary pain relief as the Thermophore. A Thermophore Moist Heat Pack is a hot fomentation product and medical professionals view it as a medical device. An ordinary heating pad will keep you warm and help you relax, but it will not penetrate deeply into tissue and will not be as effective as a Thermophore Hot Pack. If you suffer from pain that interferes with your life or keeps you from getting a good night’s rest, you will be grateful that you invested in the comfort, pain relief and relaxation of a genuine Thermophore Automatic Moist Heat Pack. Japanese mint is a plant. The oil is removed from the parts that grow above the ground and used to make medicine. Japanese mint oil is used for various digestive complaints including poor appetite, gas, indigestion, nausea, diarrhea, gallstones, liver problems, and irritable bowel syndrome (IBS). It is also used for respiratory tract problems including common cold, cough, bronchitis, and sore mouth and throat. Other uses include treatment of fever, pain, spasms, headaches, toothaches, cramps, earache, tumors, sores, cancer, heart problems, breathing difficulties, tendency toward infection, and sensitivity to weather changes. Some people use Japanese mint as a stimulant, a germ-killer, or a pain-killer. Japanese mint is applied directly to the skin for muscle pain, nerve pain, itchiness, and hives. When inhaled, Japanese mint is used for swelling of the lining of the upper respiratory tract. Japanese mint oil contains up to 95% menthol. In manufacturing, Japanese mint is also used as a fragrance in toothpaste, mouthwash, gargles, soaps, detergents, creams, lotions, and perfumes. Commercially it is used as a source of menthol. 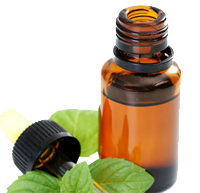 Japanese mint oil is thought to prevent intestinal gas, stimulate bile flow, and fight infections.